No, the bullets aren’t flying in circles… Grrrrrr. Some of you (that have only seen the screenshots) have remarked that the bullets appear to have a circular motion. So I’ll just squish that one right now! the planes were turning while shooting, causing the bullets to spray out. Call it straffing. in my game you can actually see the bullets. In real life you wouldn’t, because bullets travel too fast. For my arcade style game, I would like you to see the bullets, and actually have a small but fighting chance of evading them. I also didn’t take any screenshots with the planes holding steady and nailing the target. 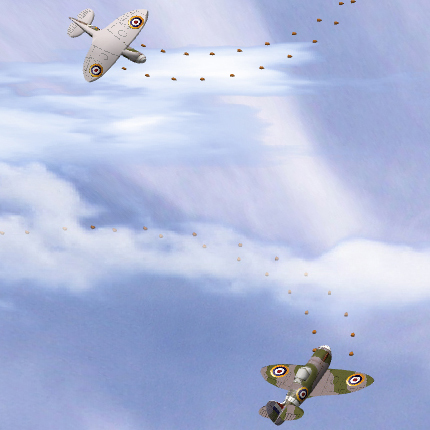 Another thing that adds to the effect, is that there are two bullets per shot – one from each wing like the real Spitty. So you get a bit of a twisty effect between the two bullets, if the plane was rolling while firing. So there we go, then. I hope that’s cleared THAT up!!! p.s. I’m considering adding a little gravity to the bullets actually. It’ll be easy, and interesting to see how it affects the game play. Some people seemed to be getting the old version, because of nasty Proxy servers serving up an old cached build.zip. Try again. I’ve renamed the build.zip to build_20060830.zip now. As promised the shooting is done! So what are ya waitin’ for? Give it a whirl damnit. I’ve uploaded the latest build. Get it here. And for a taster, check out more screenshots over here. The blog is here, but the detail is in the comments. In case you’ve been living in a cave, “Game Studio Express” is the free IDE for developing with the new XNA framework. It is being released today/tomorrow depending on your timezone!!! Initialising the Device has probably been the hardest part of getting started with game dev. I know I’m still not doing it properly – hence the lengthy troubleshooting section on getting the game to actually run. I’m elated that soon I shouldn’t have to invest any more time on that complicated aspect of game dev. There is plenty more to drool about, so read on. Doing the bullet particle system was fun, but what I had thought would be the simplest part (actually rendering the bullets) ended up taking me the whole dang evening!!! Unforseen complications – I’ll explain later. It’s not quite ready for public consumption yet, but real soon you’ll be able to shoot at…well…nothing in particular..yet. You get what you pay for, right! Due to popular demand (and JD’s nagging). I’ve changed my mind and will work on adding some SHOOTING to the game next. Not that there’s anything to shoot AT yet, but it’ll be fun. Besides, it will shut JD up for a bit. I’ll leave the refactoring till later because I’ll have a lot of refactoring to do when XNA comes out anyway. I started looking at some elegant little Particle System samples last night. Remarkably similar to my self-written CloudManager classes actually, so quite chuffed about that! Anyway, the idea cauldron is bubbling away nicely, so stay tuned. I’m just a beginner at Managed C# game development, and very much learning as I go. So this *new* XNA thing has been quite a daunting prospect and I have pretty much ignored it until now. The more I read about it though, the more I’m looking forward to it. It sounds like I’ll no longer be needing the DirectX SDK & VS.2005. Instead the new XNA Game Studio IDE will have all I need. At least that’s how I’m interpretting things at the moment. August 30th is when this shiny new IDE is expected to be released. So I guess that’s when the rewrite begins. Most of my questions & concerns were answered by this faq & this blog. I haven’t done much on the game lately (because I’ve been focusing on getting the blog going). However, I have just made a small fix and uploaded it. Fixed the known issue where the plane could disappear off the screen. Now, if you fly too high or too low the plane will change direction to stay in view. I’ll revisit this one day, perhaps having the plane get struck by lightening/ufo/stall when too high, and too low will crash into the ground – duh! I think I will work on the problems dealing with different hardware appropriately. I have some ideas on how to do this properly now, but a bit of refactoring will be necessary. New Battlefield 2142 Trailer out now! There is a new Battlefield 2142 trailer out called “Camp Gibraltar”. You can get it here. If you’re a BF2 fan you’ve gotta check it out! The most impressive trailer yet! Needless to say, I’m REALLY looking forward to this game. You are currently browsing the Sharky's Blog weblog archives for August, 2006.